Aiseesoft HD Converter for Mac, easy-to-operate Mac HD Video Converter, which is able to convert HD video, including AVCHD, HD TS, HD MPEG, HD WMV, HD MPG, HD MP4, QuickTime HD MOV, HD H.264, HD RM, etc, and any other video files to video/audio in any format for all popular portable devices with fastest speed and excellent sound/image quality. Also it owns the solution to convert between HD videos, convert between HD video and SD video, between SD videos, even between any popular audio files. 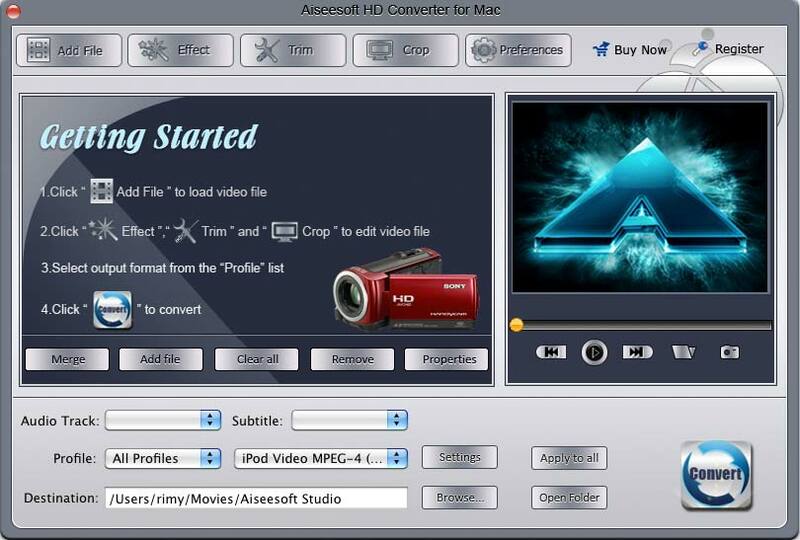 Aiseesoft HD Converter for Mac could convert HD video to HD video, HD video to SD video, and SD video to HD video. You can crop the video play region and remove the black edges easily, and get any playing area of the video by using its "Crop" function to perfectly fit your player. Get any time-length clip from source file exactly by setting the start and end time or casually drag the slider bar. You can adjust output Video Encoder, Resolution, Frame Rate, Video Bitrate, Audio Encoder, Sample Rate, Channels, and Audio Bitrate.